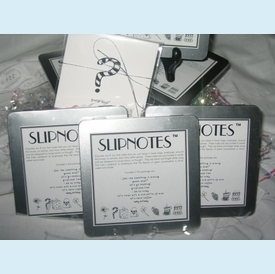 This new "Slip Notes" variety set comes in a cool, resuable square tin. Box contains 8 different notes printed in black ink on white linen paper (extra postage required). Cards are perfect for a variety of occasions...missing you, thinking of you, congratulations, etc. CLOSEOUT...only 1 set left.